The 18th (Eastern) Division would attack with all three of its infantry brigades; on the right 55th Brigade, in the centre 53rd Brigade and on the left 54th Brigade. The plan was simple but had an element of risk. Each brigade had roughly one third (600-yards) of the divisional attack frontage and would attack with two battalions as assault, one battalion in immediate support and one in reserve. This meant that every infantry battalion would be committed to battle, leaving no divisional reserve. The six assaulting battalions would attack simultaneously and adhere to a strict artillery timetable of lifts. 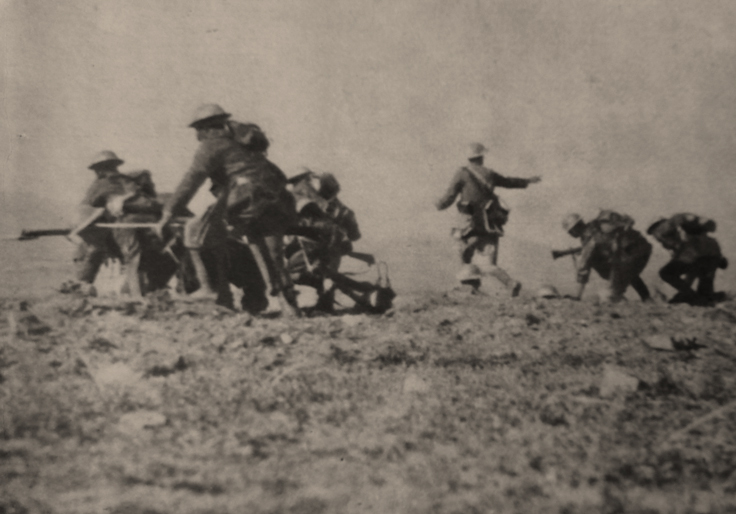 The assault battalions would attack over the entire distance from the assembly trenches to the final objective, meaning there would be no leap-frogging of units. From going over the top to Montauban Alley and in some cases beyond, the average distance over which each battalion would fight was 1,800-yards. 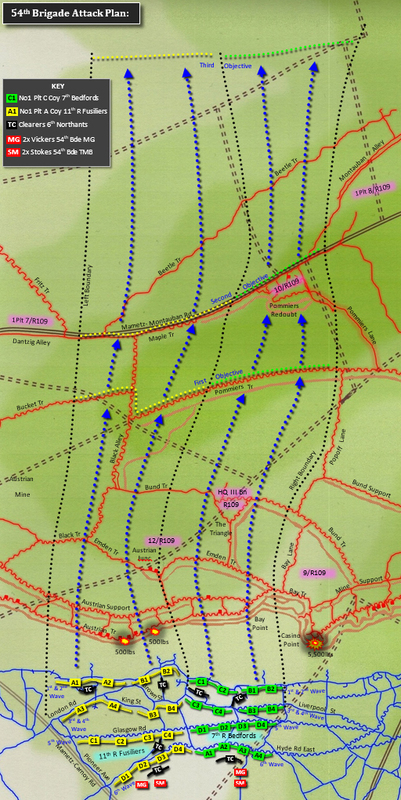 It included the German first line system comprising two or three lines of trenches, a substantial intermediate line, a reverse slope with two further trenches and four redoubts. It was to be no walkover; only a division that had trained and rehearsed fully for the job in hand would have any chance of obtaining its objectives. The infantry would require considerable artillery support and first-rate battle leadership. Considering the nature of the ground and considerable artillery support, of the three assaulting brigades, 55th Brigade ought to have had the easiest ground over which to advance. However, events played out very differently. The opening four artillery lifts and attack scheme should have seen the Brigade advance and capture the line Mine Alley, Dugout Trench and the Warren by 7.50 am, Zero Hour + 20 minutes. It would, in reality, take 2-hours 45-minutes of brutal close-quarter fighting. By that stage the supporting barrage had progressed so far in front of the infantry and heavy casualties had meant both support and reserve battalions had been committed that additional bombardments were required to assist in the taking of the final objective. 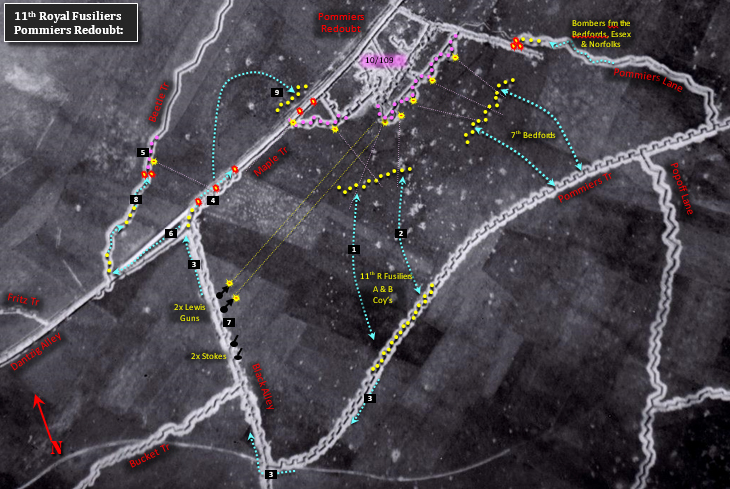 The 55th Brigade’s final objective was the long linear German communication trench ‘Montauban Alley’ 200-yards north of the Montauban-Mametz Road. On the right, the objective also included the western aspect of Montauban village. The two ‘assault’ battalions were arranged with 8th East Surreys on the right and 7th Queen’s (Royal West Surrey Regiment) on the left. The support battalion, 7th Buffs (East Kent Regiment), was sub-divided with two companies and two platoons in direct support to the attacking battalions and two specially trained platoons designated for a specific task, the assault and clearance of Carnoy Craters. Two other platoons were further sub-divided into eight sections; one section attached to each of the assault battalions’ eight companies for the task of mopping-up. The remaining two platoons were detailed as carriers for stores and consolidation material. The 7th Royal West Kents, less two platoons, would provide the Brigade reserve. 55th Bde MG Company deployed four Vickers guns of D Section on Maricourt Ridge firing overhead covering fire. C Section positioned four guns in the front trench and A Section acted as brigade reserve. 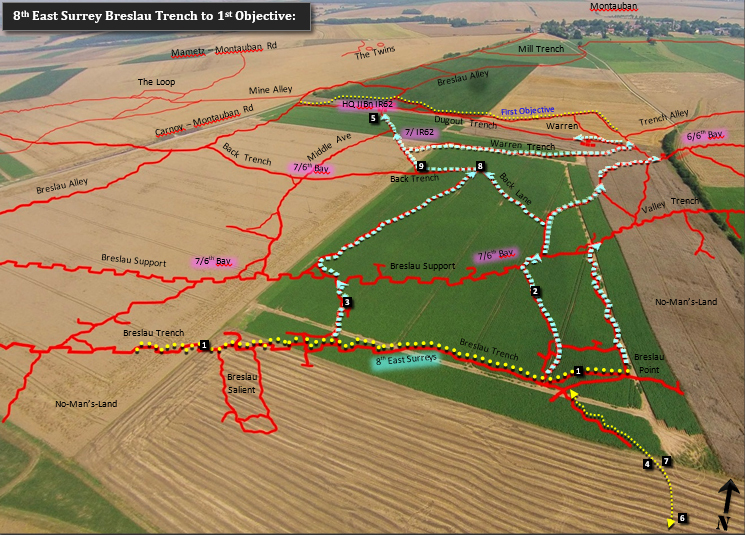 The remaining Section ‘B’ would advance with the fourth company of both attacking battalions, two Vickers per battalion. Once the final objective had fallen, A Section would advance to support the consolidation phase. The eight ‘Stokes’ of 55th Bde TMB were deployed to participate in the final 8-minutes hurricane bombardment. On completion two mortars each would advance to the rear of the two assault battalions, the remaining four Stokes forming a reserve. The Brigade scheme divided the assault into three specific phases/objectives. 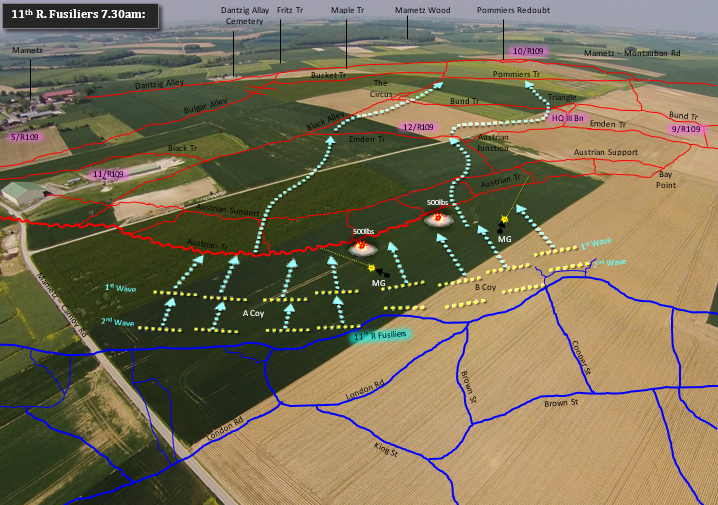 The first phase called for the infantry to capture the German fourth line known as the Pommiers Line from Dugout Trench with its junction with Mine Alley to The Warren and east to Train Alley within 20-minutes of Zero Hour. In support of the assault, the artillery planned four successive lifts, one bombardment for each successive trench line. The artillery would lift from a 65-minute bombardment of Breslau Trench (First line) at Zero Hour to Breslau Support (Second line) for 4-minutes, then lift onto Back Trench (Third line) for 5-minutes, followed by a 10-minute barrage of Dugout Trench and the Warren (Fourth Line). The second phase would see infantry attack over 1,000-yards from Dugout Trench to Montauban Alley on the left and a position on the right known as The Triangle (not to be confused with The Triangle on the north-east of Montauban). The artillery would support this with three lifts. The first lift fell on Blind, Breslau and Mine Alleys for 40-minutes. This was followed by a 62-minute bombardment of Mill Trench, The Twins and a section of Montauban Alley from Pommiers Redoubt to a trench junction 250-yards west of Montauban village. On the left, 7th Queen’s would capture their final objective and on the right 8th East Surreys would secure their second objective, a line which included The Triangle and the western limits of Montauban. The 8th East Surreys would then complete the Brigade task with a final short phase, an assault, 250-yards at its widest point, occupying the eastern section of Montauban Alley. It would be supported by a barrage that fell on Montauban Alley (east) for 4-minutes. Finally, a creeping barrage, lifting 50-yards every 2 ½-minutes, would move down the reverse slope to the low ground in Caterpillar Valley. This creeping barrage was not to be followed by infantry; it was intended to clear the dead ground of German troops massing for counter-attack and to pass over any surviving enemy artillery or isolated positions. Upon reaching the final objective the Brigade was to consolidate immediately. A forward screen would be established with scouts pushing out down the valley. Vickers and Lewis gun posts would be positioned in localities that allowed them to break-up any enemy counter attack. In-depth, the Brigade would construct twelve Strong-Points. In theory, the plan was feasible but had its advantages and disadvantages. Outright success would depend on the artillery preparation being thorough with each successive enemy defensive line having been destroyed and its shelters wrecked or blocked. The infantry would have to conform with the artillery lifts. However, on the day things would not go quite to plan. 55th Brigade was to encounter a determined enemy; many Germans had survived the bombardment, particularly in two locations where shelters had not been destroyed. The deep underground workings at Carnoy Craters retained up to 300 tenaciously led Bavarians and, in-depth, the deep dugouts on the reverse slope within The Warren and Dugout Trench, which also housed the headquarters of II Battalion IR 62, would survive. From these locations at least four Maxim machine-gun teams engaged 55th Brigade frontally and from the west flank, and as previously seen, inflicted carnage amongst the 21st and 90th Brigades of 30th Division across Train Valley. The Bavarians and Silesian soldiers defending Carnoy Spur very nearly succeeded in repelling the British assault. 17.50am Adjutant reports ‘Battalion in Breslau Trench.’ After a short check, small groups organise themselves and advance along communication trenches fighting to Breslau Support then on to Back Trench. 2Lt. Janion leads the attack, in the process he kills 10 Germans for his leadership he is awarded the DSO. 3Sergt. Griffin pushes forward with the remnants of his Company, he is awarded the MM for his leadership. 4At 8am, Battalion bombers under Sergt. Wileman and 2x Stokes Mortars under Lt. Heath cross NML. 5 Between 9am and 9.20am the Battalion overrun the HQ of IIBn IR62 killing the Bn CO Haupt, Bauke. 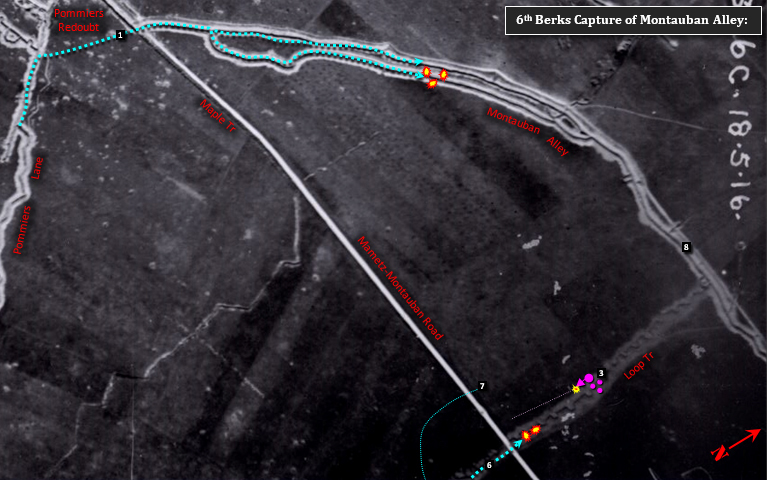 6 9.20am a runner Pte Bilson, followed by a message from Lt Griffin confirm Dugout Trench and the Warren are captured. 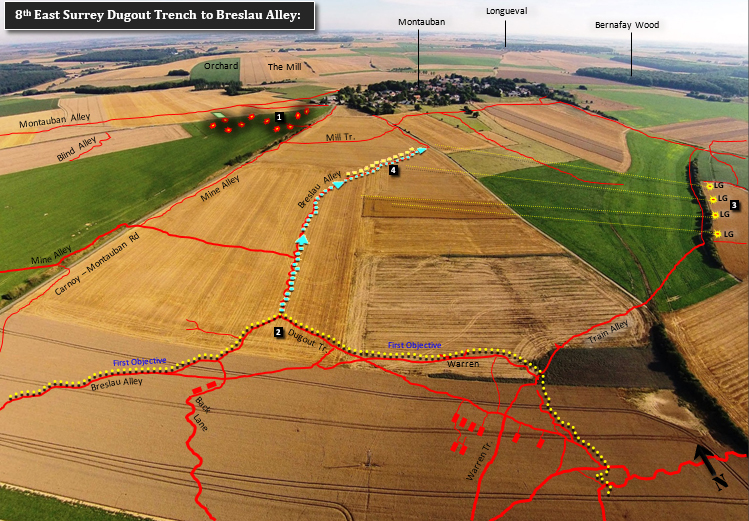 7Major Irwin goes forward 9.40am, between Breslau Trench to Back Trench he sees no one else until the junction of Back Lane & Back Trench 8 where he finds Lt. Janion, further along Back Trench 9he finds Sergt. Griffin and ten men. 110.30am Lt Griffin FOO observes German troops with machine-guns massing at the Mill and near the Orchard. He immediately engages with artillery via Lt. Carver. 211 am, Major Irwin organises all spare infantry to attack along Breslau Alley. He sets them on their way under Sergt. Willis. 3On the right Lewis-gunners from 18th King’s assist by firing on fleeing Germans. 4Sergt. Willis successfully captures the north of Breslau Alley. 1At 12.10 pm, Capt. Clare, Lt. Thorley and Sergt. Willis lead a mixed group of men in an assault through Mill Trench then on to Mine Alley. They attack in one wave, not a single shot is fired towards them. 2They take a halt in the Carnoy Road and a short trench. Taking advantage of the lack of opposition and because the artillery support has lifted, Clare gives the order to take the next bound. 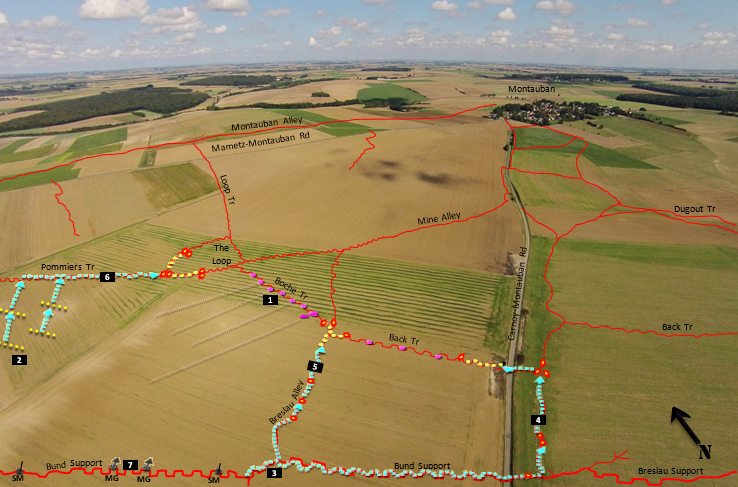 3By 12.22pm they are on the Mametz – Montauban Road, with their left 100-yards west of the last house of Montauban. 4Sergt. Willis is sent with six men to secure the left flank at the old Mill, he captures one officer and two German soldiers. The 53rd Infantry Brigade, commanded by Brig. Gen. Harold Whitla Higginson, would attack in the centre of the 18th (Eastern) Division’s frontage. Their final objective was a position, at its furthest point, 500-yards beyond Montauban Alley and on the right an ‘east flank’ defensive line along ‘East Trench,’ a German communication trench that ran between Montauban Alley and Caterpillar Wood. Their advance from the British parapet to the furthest position was 2,300-yards, the furthest objective of the three divisional infantry brigades. 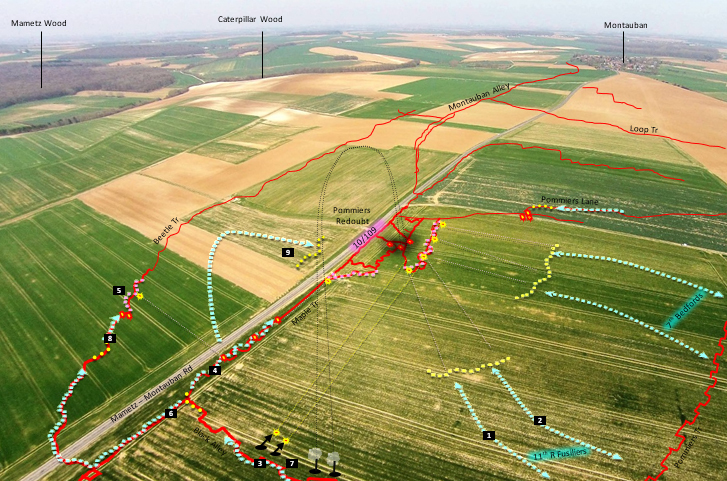 The centre of the assault would launch across the flat crest of Carnoy Spur between two notorious and strongly defended enemy positions, Carnoy Craters on the right and Casino Point on the left. To help in capturing these formidable locations several supporting elements had been arranged including, as we have seen in earlier chapters, an offensive mine beneath Casino Point, several smaller bore-hole charges, two flame projectors and Vickers machine-guns in advance saps. On the left flank a late addition to the plan included a Special Brigade smoke barrage against Casino Point, a possible insurance policy should the Casino mine fail to detonate. Once the first two German trenches were captured the Brigade would have to fight through several redoubts and intermediate lines including ‘The Castle’ on Carnoy Spur, Bund Support, ‘The Loop’ in Carnoy re-entrant before climbing Montauban Ridge through Pommiers Trench and over the ridge to Montauban Alley and beyond down the reverse slope of Caterpillar Valley. The Brigade was in for a long day of fighting that would see the Kitchener soldiers use every weapon in their armoury and utilise new innovative low level infantry tactics to achieve their objectives. Go straight for the objective and get it quickly. Should strong resistance be encountered the situation must be dealt with by the troops in the immediate vicinity. Attacks must be organised from both flanks, while the enemy is held by the troops in front. Lines immediately behind the part held-up must not barge forward on the top of the troops held-up. Smoke bombs and rifle grenades are useful on these occasions. If the enemy’s resistance cannot be overcome by the troops on the spot, Stokes Mortars must be got up and flank attacks by reserves organised. These two requisites, it was anticipated, would avoid lengthy engagements and the need to bring forward reserves to deal with unforeseen situations, both of which could easily see the infantry fall behind the artillery timetable. As soon as it begins (high rate of fire) the first wave of the assaulting Bns, will move out of No.1 Assembly Trench and form up in line parallel to MINE TRENCH and from 60 to 100 yards from it, lie down and wait for the barrage to lift. If the first wave could close the distance to as little as 60-100 yards they should easily win the race to the enemy parapet. Two Vickers machines-guns firing from Sap openings in No-Man’s-Land would also provide covering-fire while the infantry formed up. However, what could not be predicted was the late firing (estimated at 30-60 seconds) of the 5,500lbs Casino Point mine which would inflict casualties on men of the Brigade. Once in the German first line system the assault battalions would continue the attack following the artillery bounds in five infantry waves 100-150 yards apart. The right assault battalion was instructed at this point to veer east and link with 55th Brigade to the rear of Carnoy Craters. On the left the artillery would bombard Bund Trench for 4-minutes before lifting to Bund Support, the German third line, for a further 10-minutes. This would be followed by a further barrage of 10-minutes on the German fourth line, the first objective Pommiers Trench, including The Loop, Boche Trench and Back Trench. By 7.50 am the first objective would be secure. Now there would be a wait of 40-minutes during which the artillery would target Pommiers Redoubt, Pommiers Lane, Loop Trench and Blind Alley. The infantry would re-organise, clear all captured positions and rear waves would start the consolidation of specific points and the creation of stores dumps. 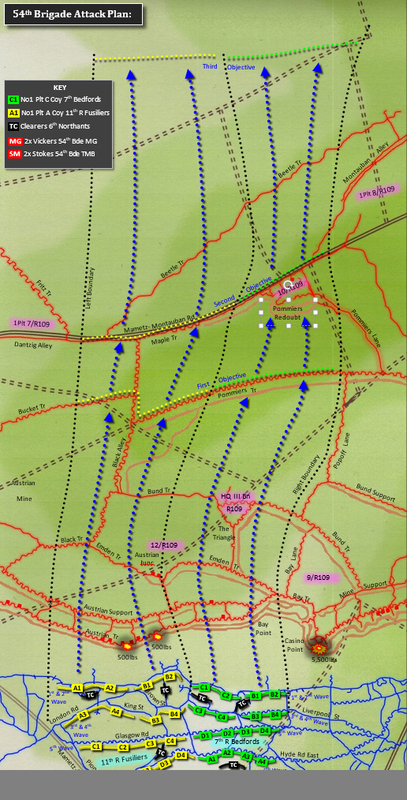 At 8.29 am the advance would continue up the slopes of Montauban Ridge with the bombers assaulting up Loop Trench which linked the German fourth line with Montauban Alley. One-hour was allocated for phase two during which the artillery would hit Montauban Alley, the Brigade’s second objective. At 9.30 am the artillery would lift, commencing its creeping barrage down the reverse slope and the infantry would capture the second objective. All that remained was an advance to the final objective, 450-500 yards beyond. 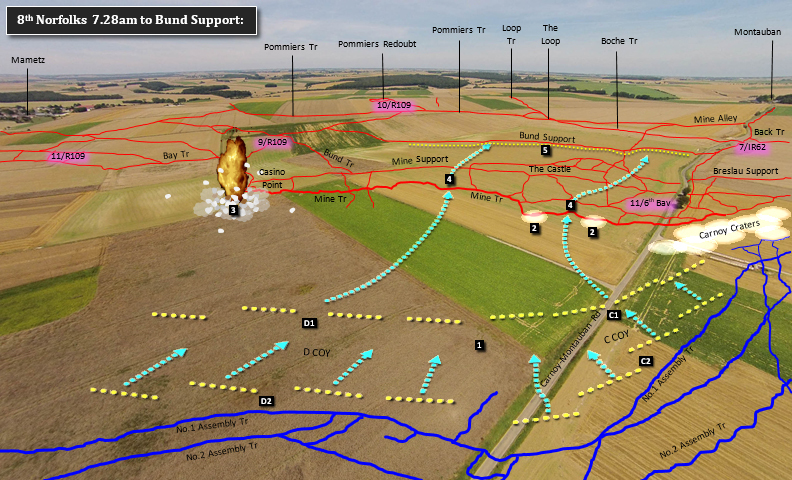 For the final phase the fourth company of both attack battalions would advance through the first waves while they, the first two waves, consolidated Montauban Alley. The right battalion, 8th Norfolks, would form a defensive flank to the east and 6th R Berkshires take up a defensive line of posts facing north towards Caterpillar Wood. Both battalions would push forward scouts and Lewis-gun teams as early warning and as a protective screen while the Brigade consolidated and constructed up to nineteen Strong-Points. The Brigade plan was feasible should everything proceed as per the strict time-table. On Z-Day the attack started well before being held up. The military adage of ‘no plan survives contact with the enemy’ is relevant here. Stiff resistance on the right flank was encountered in the German fourth line which should have been captured at 7.50 am, Zero Hour +20-minutes. The left of the fourth line did not fully fall until 10.20 am, 2 ½ hours behind the ‘fixed’ timetable whilst the right only fell at 2 pm, nearly 6-hours behind schedule after ferocious fighting during which most of the junior officers were killed or wounded. These delays had a subsequent knock-on; the left could advance but found itself under constant harassment from the rear and Germans still holding out in the strong-point in their fourth line. It was not until after the resolute strong-point had fallen that further advance could be achieved. At 4 pm an assault crossed the Montauban – Mametz Road and again came into contact with a determined foe. Only at 8 pm was the final objective taken, 8-hours overdue. It was only through thorough artillery preparation, dogged determination, good junior leadership, extensive training and rehearsals and the use of new weapons and tactics that 53rd Brigade succeeded (if a little late) in the capture of all its objectives. 1 At 7.27am 8th Norfolks attack in six waves with C Coy front right, D Coy front left, forming the first four waves. The first two waves of each Company formed the assault platoons both comprising of four sections. 2 At 7.27 am two small 350lbs mines detonate destroying several dugouts and a section of trench. 3 7.28am the Casino Mine (5,500lbs) detonates slightly late destroying Casino Point. 4C & D Coys enter Mine Trench which is easily taken, they quickly advance to Mine Support and The Castle. 5 As the first waves cross from Mine Support to Bund Support they come under heavy fire from Mine Alley, Back Trench, Boche Trench and The Loop, stalemate ensues lasting for hours. 1As the Norfolks advance over the open they come under heavy fire from German MGs and snipers. 2At 1030 am D Coy under the command of CSM Raven enter Pommiers Tr by advancing in rushes. 3Just after midday bombing assaults push north supported by two Stokes mortars and two Vickers MGs. 4On the right 2Lt. Miall-Smith with 1 Plt of B Coy and half the Battalion Bombers under Sergt. West bomb up Breslau Alley. 5On the left 2Lt. Grundy-White C Coy and half the Battalion Bombers bomb up Mine Alley. 6At 2.02 am Capt. 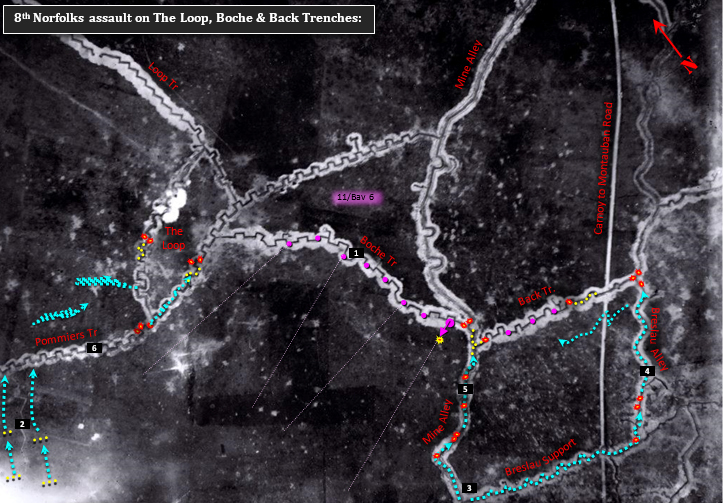 Morgan leads D and B Companies in bomb attacks from the east along Pommiers Tr and into The Loop. 7Support proved from 2x Vickers and 2x Stokes Mortars. 12nd Lt. Courage leads the left assault comprised of the Battalion Bombers and Beer Coy across the Mametz-Montauban Road along Maple Trench and bombs along Montauban Alley, progress is slow as the Germans put up a determined resistance. 2Capt. Fenner, A Coy soon after leads a right assault up Loop Trench. 3As the right nears the road they are stopped by a small German strong-point. 4Lt. Rushton arrives with a Stokes and four bombs. 5One Lewis-gun is deployed to provide covering fire. 6Bombers of A Coy, Battalion Bombers and 10th Essex attack under cover of the Stokes and Lewis-gun, but are beaten back. 7Lt. Rushton attempts to rush the strong-point but is killed, 2nd Lt. Saye tries next and is mortally wounded, lastly CSM. Sayer attempts and succeeds in killing the German although wounded. 8At 5.30pm the Left and Right assault parties link up in Montauban Alley, their second objective captured. The 54th Brigade, commanded by Brig. Gen. Thomas Herbert Shoubridge DSO, had the daunting task of conducting a direct frontal uphill assault through six lines of German trenches to the summit of Montauban Ridge. Due to the topography, each successive enemy trench could be mutually supported by those in its rear, like a terrace of consecutive trenches. Several more German positions strengthened the overall defence, namely The Triangle on the third line, Pommiers Trench on fifth line which dominated all the first four enemy trench lines, and then the extensive Pommiers Redoubt on the crest of Montauban Ridge. Belts of barbed wire protected all six trench lines, Pommiers Redoubt had two belts. If the Brigade was successful in gaining Pommiers Redoubt, a further two more trenches ran across the reverse slope of the Ridge. Brig. Gen. Shoubridge counted on success via a combination of factors. Firstly, the effectiveness of the preliminary bombardment in cutting the numerous lines of wire entanglements, reducing and destroying the trench defences and killing and demoralising the opposition. This he would achieve through superiority in artillery and by the excellent observation afforded over the forward facing German position. Secondly, he needed a sound and simple infantry attack plan, which his battalions had meticulously trained for and rehearsed. It was crucial that every man knew his own and everyone else’s task and their allotted position at any phase of the operation. The 54th Brigade would attack on the left flank of the 18th (Eastern) Division as the western most brigade of XIII Corps. On the right were fellow divisional troops of the 53rd Brigade. On the left, a boundary existed with the 91st Brigade, 7th Division, XV Corps. The Brigade plan of attack adhered to the overall Divisional scheme with three fixed objectives and an artillery timetable of lifts. The three objectives overlapped and linked into the 91st Brigades objectives, this ensured first wave troops of both Corps’ arrived at their objective lines at the same time and advanced to their next objective line simultaneously. 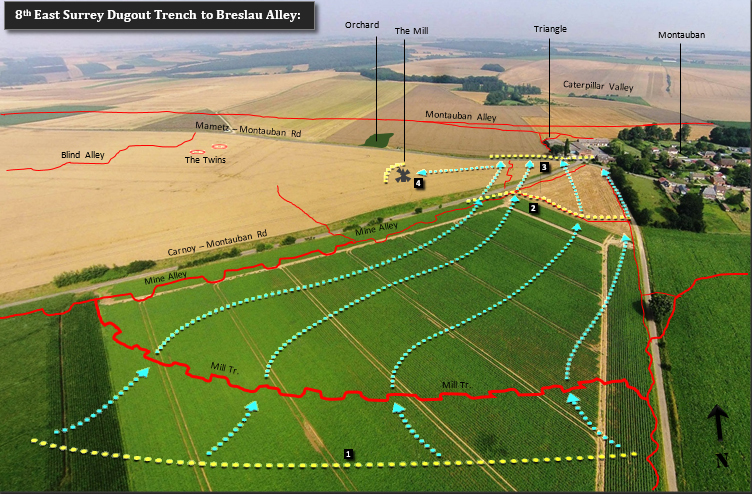 The plan called for two battalions to assault from the British first trench through to the final objective. For this task 7th Bedfords would adopt the position as right assault and 11th Royal Fusiliers left assault. In support, 6th Northamptons would provide one company and two platoons each to the two assault battalions as special trench clearers, prisoner escorts, and an immediate reserve. The remainder of the Battalion would act as carriers for attached Stokes mortars or Vickers machine-guns and RE stores for the construction of Strong Points. The 12th Middlesex formed the Brigade reserve. The first objective was the Germans’ fifth defensive line, Pommiers Trench from its junction with Popoff Trench on the right to a point 120-yards west of Black Trench on the left. Three artillery lifts would support the first phase, lifting off Austrian Trench and Austrian Support at 7.30 am onto Emden Trench for 4-minutes, lifting to Bund Trench for 1-minute, then on against Pommiers Trench for 14-minutes. Within twenty minutes of Zero Hour the first objective would be captured. There would then be a 40-minute bombardment of Pommiers Redoubt, Pommiers Lane, Maple Trench and Fritz Trench. At 8.30 am the artillery would lift onto the reverse slope of Montauban Ridge with a one-hour barrage targeting Beetle Alley and Montauban Alley. 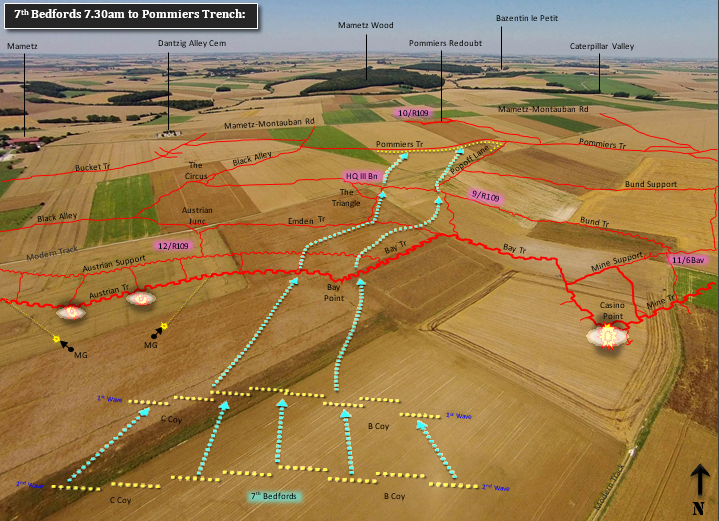 During this hour the two attack battalions would seize the second objective which ran along the crest of the ridge astride the Mametz-Montauban Road, including Pommiers Redoubt. 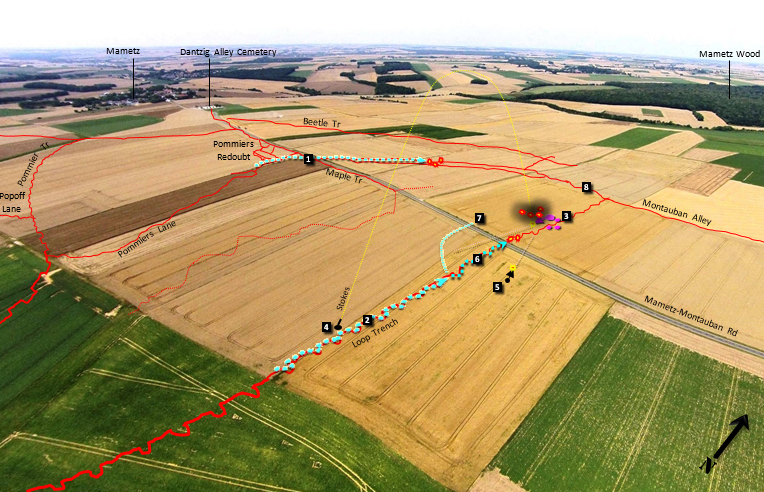 The third and final phase would see the infantry advance at 9.30 am. As the barrage lifted off Beetle and Montauban Alleys it would creep forward down the reverse slope of the Montauban Ridge, advance 50-yards every 1 ½ minutes with infantry following behind to a point 600-yards north of the Mametz-Montauban Road, this line would mark the third and last objective. The object of these barrages is to prepare every step of the Infantry advance and to allow the infantry to get within assaulting distance of the enemy’s trenches before he can man his parapet… In all cases the leading troops must work forward to within 60 to 100 yards of each barrage so that immediately it lifts they are within charging distance. The closer the barrage is followed, the greater the possibility of success. Brig. Gen. Shoubridge also addressed several points of importance which he considered as crucial to success. Firstly, he insisted that the left flank of the 18th Division should be defended at all costs. To achieve this, Black Alley, a trench running roughly north-south and facing Mametz, would be consolidated at the earliest opportunity. His second point dictated that whatever the outcome on the Brigades left or right, the crest of Montauban Ridge must be captured and held at all costs. Failure to seize and hold the high ground would result in a total collapse of the Brigade attack and would force a withdrawal back to their original start line. His final point stressed the importance of a rapid consolidation on the second and third objectives and the necessity to push forward strong detachments with Lewis-gun teams to points where they could observe over Caterpillar Valley. These detachments would act as an early warning and an advance defensive screen capable of breaking up enemy counter attacks. The opening stage of the assault was to be supported by the detonation of several mines. On the right, although outside of the Brigade boundaries, machine-guns in Casino Point acquired an enfilade shoot across No-Man’s-Land and the German first trench system on 54th Brigade’s axis of advance. The previously mentioned 5,500lbs Casino Point mine greatly support the first phase of the advance by eliminating that threat. Also, to the Brigade’s advantage, and outside of its boundaries, was a planned Special Brigade 4-inch Stokes mortar smoke barrage. The smoke screen was to be fired in-front of and over Casino Point. The cloud it produced would mask out Casino Point should the mine fail to detonate. It would also form a screen across the Brigade’s right flank as it drifted at 5 mph in a north-westerly direction. Slightly to the left of the central boundary, between the two assault battalions, two 500lbs bore-charge mines were positioned close to the German first line, Austrian Trench. These two charges would ‘take-out’ several trench bays each and possibly collapse any nearby underground shelters. Incorporated into each of the two ‘mines’ galleries was a spur to an opening for a Vickers machine-gun. From these openings two Vickers would engage the German parapet before Zero Hour. Also supporting the attack, 54th Bde TMB distributed eight 3-inch Stokes along the Brigade frontage each with 320 bombs and attached two Stokes to each of the vanguard battalions. They would advance with 60 bombs per mortar. 54th Bde MG Coy divided its guns with two guns in the previously mentioned forward Saps, two guns per attacking battalion, six guns in Caftet Wood firing in support of the advance and four guns with the 6th Northamptons for consolidation. 1At 8.30am the 40-minute bombardment of Pommiers Redoubt, Maple Trench and Pommiers Lane lifts. Men of A & B Coy’s assault up the slope towards the redoubt with the 7th Bedfords on their right. Under intense fire the attack fails with the survivors falling back 2A second attempt tries advancing in short rushes, this also fails. 3Capt Johnston OC B Coy decides to try something different. He leads his men along Pommiers Trench and up Black Alley to A Coy’s block at Maple Trench commanded by 2Lt Savage. 4Johnston leads a bomb assault along Maple Trench towards the Redoubt until they encounter a long straight section of trench which is under heavy fire from the Redoubt and a party 5of Germans in Beetle Trench. 6Johnston pulls back to Savage’s trench block and asks him to attack the German Beetle Trench party. 7Johnston organises two Stokes to engage the Redoubt and two Lewis guns to enfilade along the first two trenches of the Redoubt. 82Lt Savage attacks the German party killing them or making them flee but is killed himself. 9As the Stokes and Lewis guns put down covering fire Johnston leads his men in a wide loop attacking the Redoubt from the rear soon after the German resistance breaks and 54th Bde troops enter on all sides.